Statues of Dublin: The Phibsborough Volunteer | Come Here To Me! « The Dublin pub that got dismantled, shipped to Zurich, and put back together again. Leo Broe, himself a member of the Irish Volunteers, is best remembered today for his various monuments to Irish republicans throughout the country. His memorial sculpture opposite Phibsborough Library on the North Circular Road is one of my favourite statues in Dublin, dating back to 1939. The statue serves as a monument to the men of the Old ‘C’ Co.1st Batt, Dublin Brigade. Made of Irish limestone, and standing an impressive sixteen foot, it was unveiled on February 19 1939. Interestingly, the statue takes the form of a drinking fountain. The statue shows a man in Volunteer uniform clutching a rifle. On the day it was unveiled, Capt. Sean Prendergast unveiled the monument while Seamus Byrne delivered the oration. The Irish Times estimated that three thousand people had attended the unveiling of Broe’s statue. Vandalised in the 1970’s, and the Volunteer stood for many years with no rifle in his hand, until his restoration in the early 1990s. The image below comes from an issue of inDublin magazine dated August 6th 1981, and first uploaded to the excellent dxarchive.com site, a tribute to Irish pirate radio stations, as Dublin’s first pirate television station ‘Channel D’ operated out of the old ‘State Cinema’ building in Phibsborough, just next to this monument. Leo Broe, of Harolds Cross, was responsible for some excellent monuments nationwide. 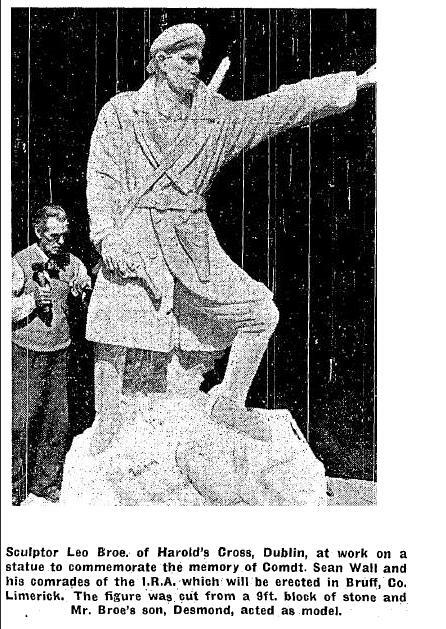 This cutting from The Irish Independent shows him at work on a monument which would end up in Bruff, Limerick. His monuments are to be found across the four provinces. Leo Broe’s profile on the Dublin City Galery page notes that “much of Broe’s time was taken up with ecclesiastical work for Dublin churches, along with IRA memorials in provincial districts.” He died in 1966, with his son Desmond Broe going on to become noted in the field himself. Just around the corner, and featured on Come Here To Me in the past, is a small plaque to Sean Healy, the youngest republican casualty of the 1916 rising. The Broes were our neighbours in Rialto in the 40s/50s. Local lore was that all their figures had faces of the Broe family. Irene, the daughter, was also a sculptor. 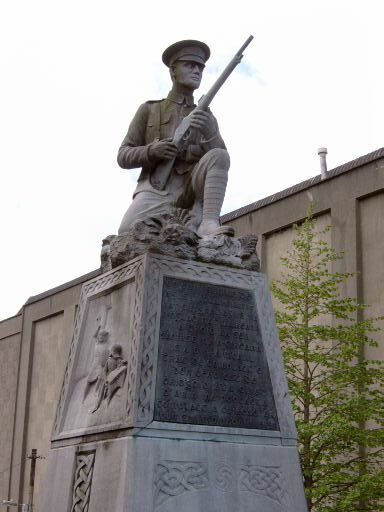 As it happens, the “model” used for the statue in Phibsboro was my Grandfather, who was a volunteer in C Coy. (and NOT related to Broe!). 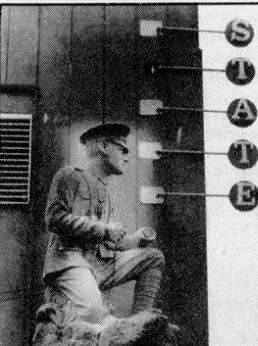 I’m not sure how he was chosen (beyond the fact he was a member of the company being commemorated) but I have a couple of photos of him posing for the statue. Incidentally, his name was Feilim O Gallchobhair, although he used the alias Peadar Meehan during the War of Independence. on June 19, 2013 at 8:34 pm | Reply Some Huguenot inspired place names in Dublin today. | Come here to me! on July 9, 2014 at 10:20 am | Reply The IRA memorial in Ballsbridge | Come here to me! Broe also sculpted the replaced statue of the Virgin Mary at Tolka Bridge.